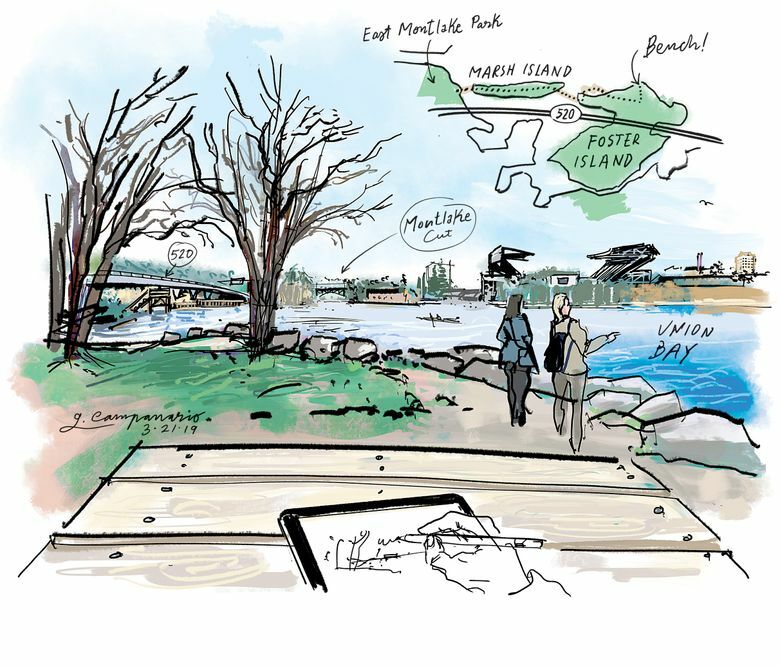 Yep, that’s my right hand holding an Apple Pencil as I draw the breathtaking view from Foster Island on my iPad on the second day of spring. Have you been to this Seattle island on Union Bay, just across the water from Husky Stadium? You don’t have to take a ferry or drive on a floating bridge to visit it. You can just take an easy stroll! The bench at Foster Point where I sat to sketch can be reached walking north from the Washington Park Arboretum, but my favorite way to get there is from East Montlake Park (look for the path that starts at East Hamlin Street and East Park Drive East). As you walk through floating boardwalks and muddy, bark-covered trails, you get to see all kinds of waterfowl and native plants up-close, not to mention rowers, kayakers and all the boat traffic going through the Montlake Cut. The walk takes only about 20 minutes but it packs so much visual stimulation that you’d be better off blocking at least an hour to explore. Or maybe two if you plan a “sketch walk” like I did.